New to Our Site or Trying to Get Information? Learn or find out more about the Wellness Recovery Action Plan or WRAP from the official WRAP site. WRAP Is a simple system to keep yourself well for Life and if you want more information start in the WRAP section of the website. Need help? The Crisis Button is on every page. Click on the button and find resources that are available. (2) the WRAP Info Center Article Search located on the WRAP Info Center pages searches only the WRAP Info Center articles. Search result titles that display in BLUE are articles from the WRAP Info Center and a GREEN title denotes website pages or WRAP News articles. 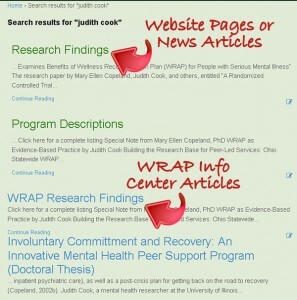 Check out the WRAP materials published by Mary Ellen Copeland, PhD. Preview many of her books and read about which resources will best suit your needs. You can get to Mary Ellen’s Facebook page from every page on the site. Facebook is a great way to stay on top of what is happening with WRAP and Mary Ellen. Like us and join the conversation. Read stories about how WRAP has worked for others and learn what Wellness Tools might also help you. Need more help or cannot find what you need?